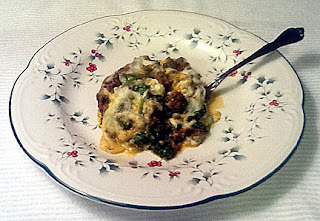 What I did is substitute spinach for the lasagna noodles. My family loves it so consequently, I make this yummy dish once every other week. Another great thing about this recipe is that it makes 2-9x13 pans of lasagna so you cook once and have dinner for several nights. And trust me, no one complains about eating these leftovers! In a large pot, brown ground beef. Drain beef, then season meat with salt and pepper to taste. Saute mushrooms in butter until tender. To the ground beef, add mushrooms, tomato sauce, and garlic powder. Simmer on medium-low. In a large mixing bowl, mix together Ricotta cheese, cream cheese, sour cream, green onions, and green chilies. Set aside. Grease 2-9x13 pans with butter or non-stick spray. Open one of the packages of baby spinach leaves and divide the spinach equally between the two 9x13 pans. Put a very thin layer of the meat mixture on top of the spinach in each 9x13 pan. Keep in mind, you will need to split this meat mixture up into four parts (2 layers x 2 pans). Sprinkle some Parmesan cheese on top of the meat mixture. Divide the mixture evenly between the two 9x13 pans and place the green chili/cream cheese mixture on top of the meat mixture. Open the second package of baby spinach leaves and divide the spinach equally between the two 9x13 pans, layering it on top of the green chili/cream cheese mixture. Divide the remaining meat mixture equally between the two 9x13 pans, layering it on top of the spinach. First, sprinkle some Parmesan cheese on top of the meat mixture in each 9x13 pan. Then top each pan of lasagna with 2 cups of Mozzarella cheese. Cover with foil and bake at 375 degrees for 30 minutes. Remove the foil and if the mozzarella isn't quite melted, cook for another 5 minutes, uncovered. The amount of carbs in a lasagna made with pasta is 36.5 per serving. And believe me, you won't miss the pasta. Thanks for the recipe. This is one of the best recipes I have seen for a low-carb lasagna. I love eating lasagna but the problem I face is that most of the recipes have too much carbohydrates and fat. These fats are not good for our health and those who want to lose or maintain weight.